A sharp-eyed NASA spacecraft celebrates four years of circling the moon this Sunday (June 23), just in time for the "supermoon." Since arriving in orbit on June 23, 2009, NASA's Lunar Reconnaissance Orbiter (LRO) has given scientists a much deeper understanding of Earth's nearest neighbor, mission team members said. Appropriately enough, LRO marks its fourth anniversary on the same day that the biggest and brightest full moon of 2013 — the so-called "supermoon" — lights up Earth's night sky. The moon's path around Earth is slightly elliptical; distances between the two bodies vary from 225,622 miles (363,104 kilometers) at the closest lunar approach, known as perigee, to 252,088 miles (405,696 km) at apogee. Supermoons result when the full moon and perigee coincide. The $504 million LRO spacecraft is about the size of a Mini Cooper car and sports seven different science instruments. It zips around the moon at an altitude of 31 miles (50 km). LRO launched on June 18, 2009, along with a piggyback probe called the Lunar Crater Observation and Sensing Satellite. In October 2009, LRO watched from orbit as LCROSS and the duo's Centaur booster rocket slammed deliberately into a shadowed crater at the moon's south pole, blasting out surprisingly large amounts of water ice. LRO initally worked as a scout, studying the moon to help NASA plan for future lunar exploration missions. It wrapped up this work in September 2010, then switched over to more of a pure science mode. The spacecraft has been incredibly prolific, beaming home about 434 terabytes of data thus far. That's more than all other NASA planetary missions combined, space agency officials have said. LRO's accomplishments are many and varied, reflecting the diversity of its instruments and mission profiles. At the lunar poles, for example, LRO's Diviner instrument measured the coldest temperatures ever recorded on a solar system body (minus 397 degrees Fahrenheit, or minus 238 degrees Celsius). Other LRO gear has helped scientists realize that the polar regions likely harbor immense amounts of water ice. Further, the Lunar Reconnaissance Orbiter Camera has mapped all of NASA's Apollo landing sites in high resolution and returned images that show the moon is still contracting, researchers said. 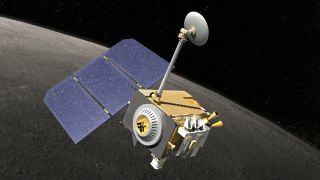 Data from the probe's laser altimeter helped mission scientists build the best map of lunar surface altitude variations ever constructed, and LRO's Cosmic Ray Telescope for the Effects of Radiation instrument (CRaTER) measured the radiation environment around the moon. "In its four years in orbit, LRO has revealed a new moon with discoveries that address the moon's history and by extension the Earth's history as well," John Keller, LRO project scientist at NASA Goddard, said in a statement. "The innovative measurements by LRO have answered many questions asked by planetary scientists, but have also uncovered new questions as well," Keller added. "I'm looking forward to future work on these new questions as LRO continues to study the moon." To date, LRO has completed nearly 18,000 orbits, traveling about 125 million miles (200 million km) around the moon in the process, researchers said. It's slated to continue operating until October 2014, though a two-year mission extension is a possibility.